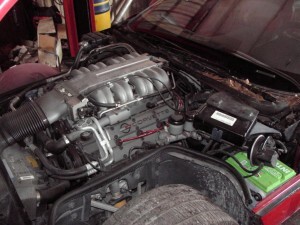 Here is a ZR-1 corvette that we are doing some engine mods to. The bore will be increased to 4.125 and crank will be offset ground to achieve a stroke of 3.75 for a new displacement of 402 cubic inches. 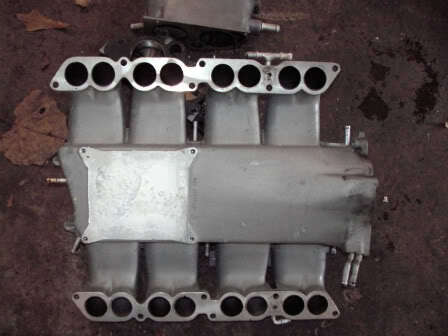 The heads, injector housings and plenum will be sent out for porting, the secondary throttle blades will be removed, and new intake and exhaust cams will be used. 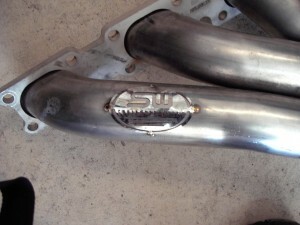 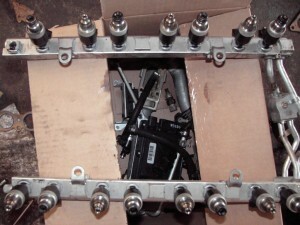 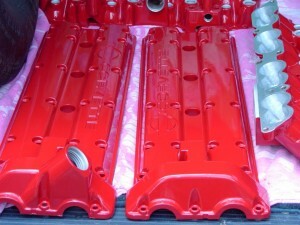 Larger injectors will be used as well. 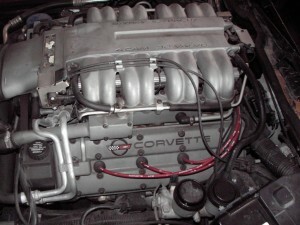 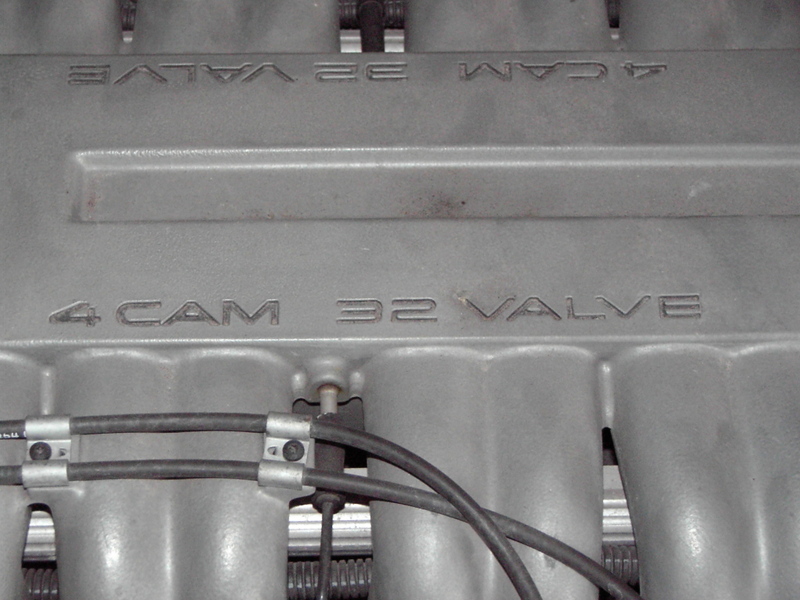 For those not familiar with the ZR-1 Corvette, the LT-5 engine was a QUAD Overhead Cam, 4 Valve Per Cylinder aluminum head, aluminum block/steel liner engine that was DESIGNED by Lotus and BUILT by Mercury Marine. 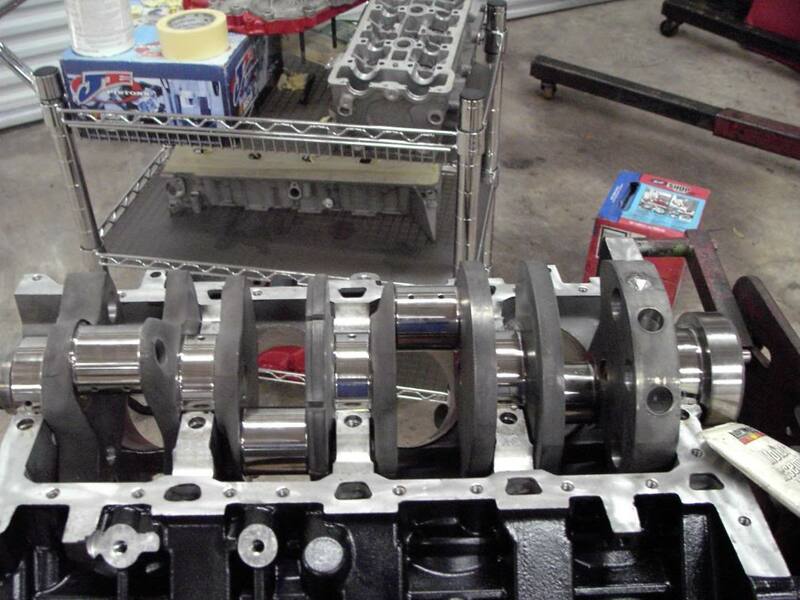 At the time of it’s inception there were no automobile factories in the United States CAPABLE of building such an engine so General Motors enlisted Mercury Marine for the engine! The engines were then transported to the Corvette assembly plant in Bowling Green, Kentucky. 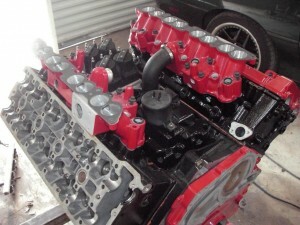 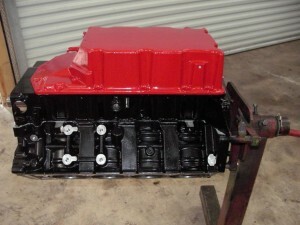 Just a few “before” shots of the engine. 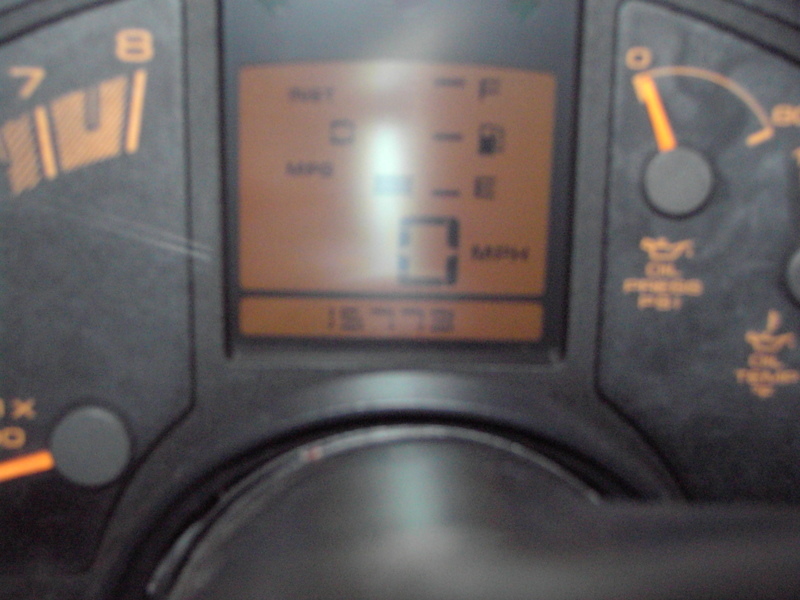 Kinda hard to see, but this ZR-1 has less than 16,000 miles on the clock. Twin overhead cams… A shot of the intake ports on the heads…those butterflies you see are the secondary ports…the butterflies only open when you turn the key switch on the console to “full power”, otherwise it uses only the smaller primaries. These throttle blades will be removed and the ports CNC ported. 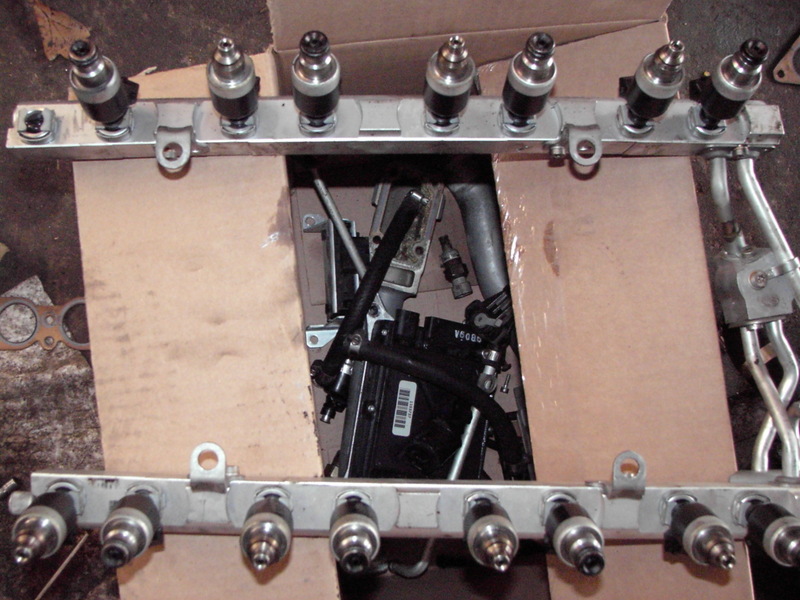 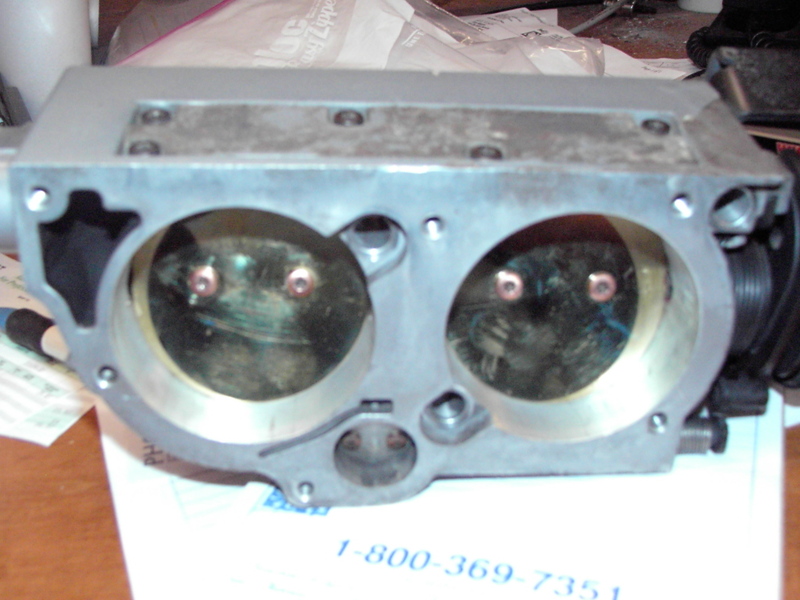 These injector housings mate up with the above head ports…These ports will be larger as well. 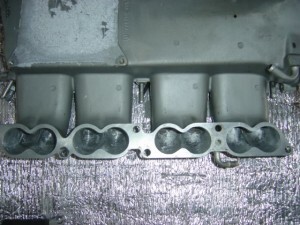 The plenum mates to the injector housings…That square whitish area is where the ignition control module mounts…the module and ignition coils are under the plenum…These ports will be enlarged as well. 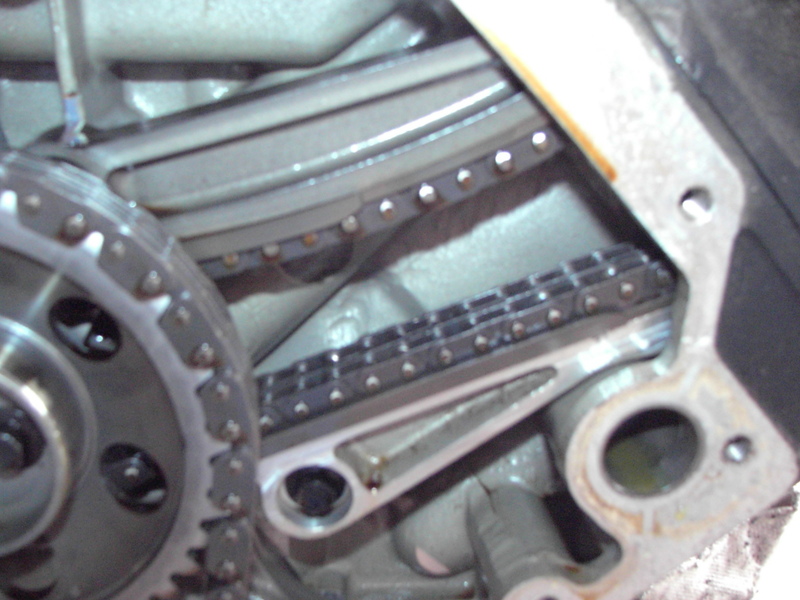 Chain for the driver and passenger side heads. 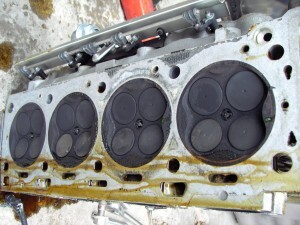 Hard to believe that dished piston yields 11:1 compression…But that is not a lot of chamber volume…. 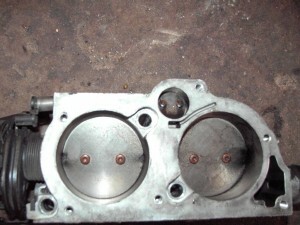 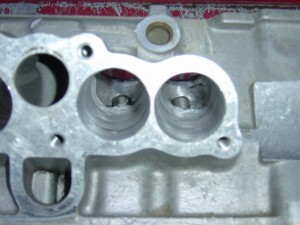 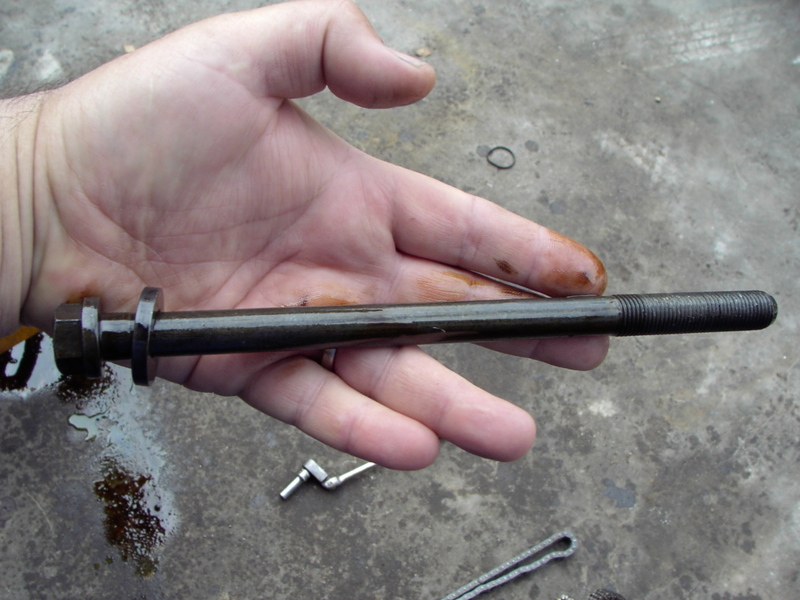 Look at the length of that head bolt….. A shot with the pan off….Notice how the block is a two piece design…The main caps are incorporated into an “intermediate” girdle assembly…MANY engine use this technology NOW but was rare in 1990. Check out the plugs in the crank….This is a center oiled crank…Instead of the oil pump pressurizing passages in the block then sending oil to the crank through those passages, this LT-5 has the oil pump driven by the front of the crank and oil is sent to the crank FIRST, then to the passages in the block. 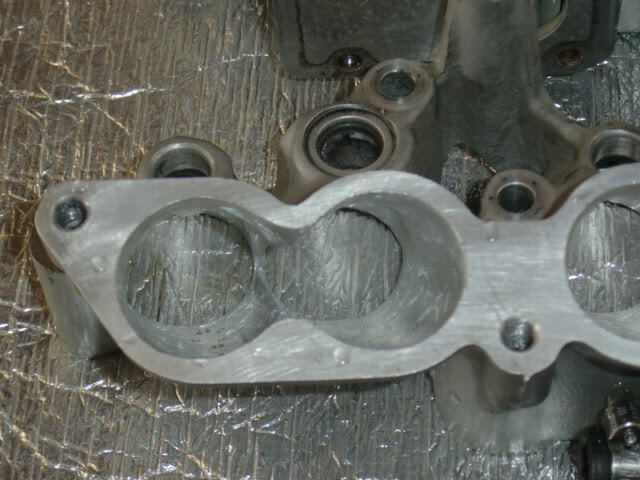 There are cup plugs in the crank centerline as well…. Here is the main girdle assembly…. 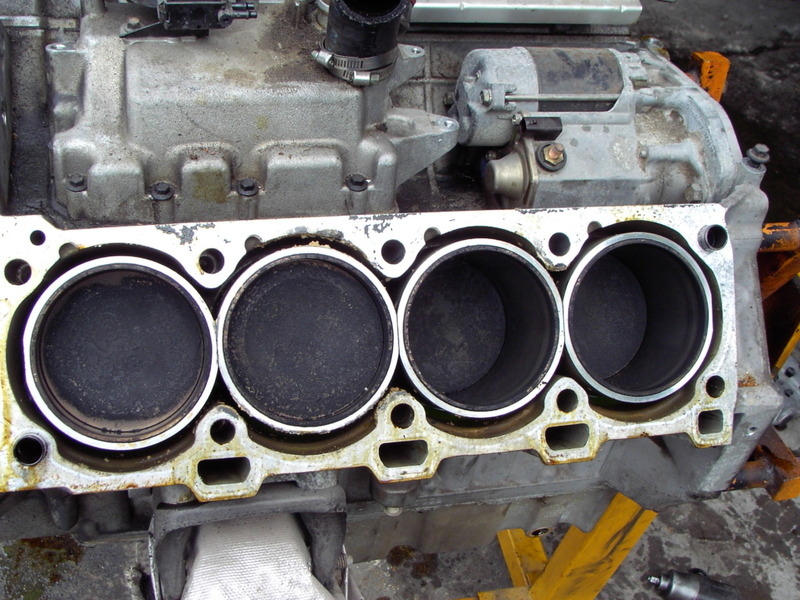 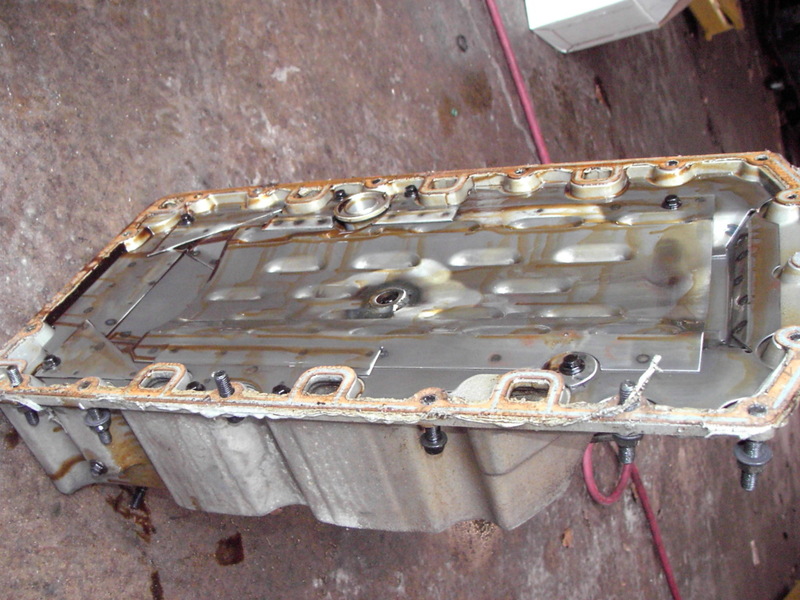 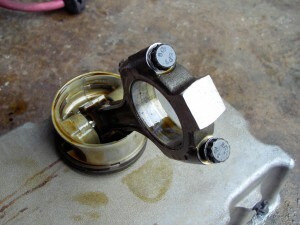 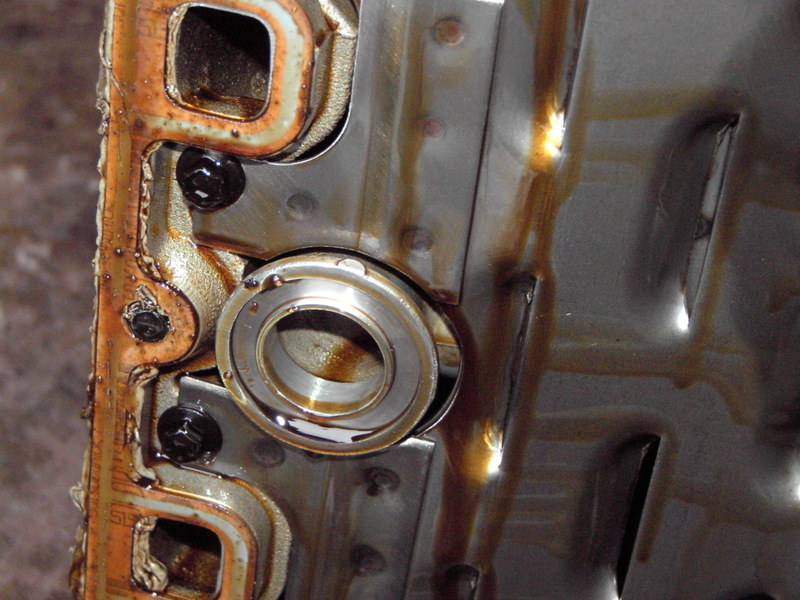 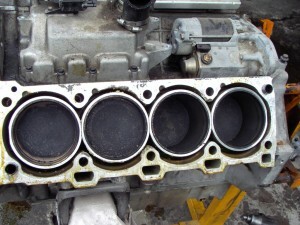 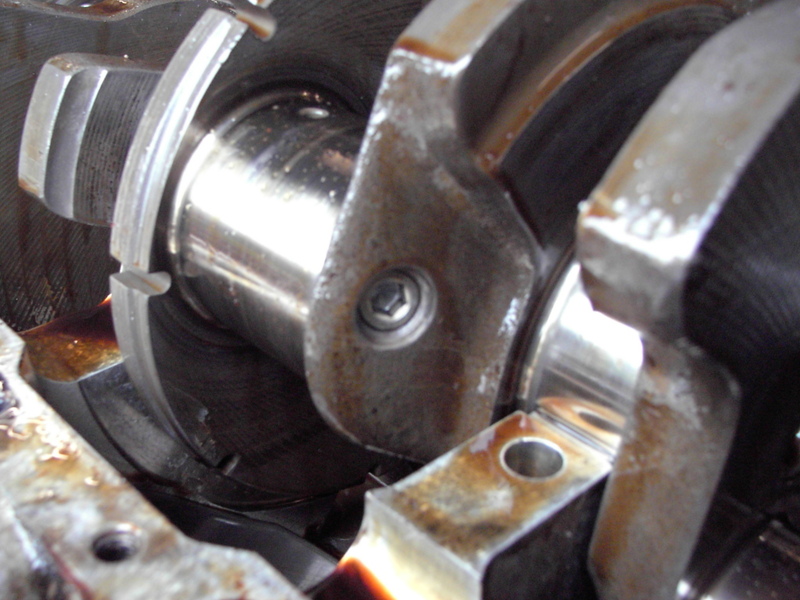 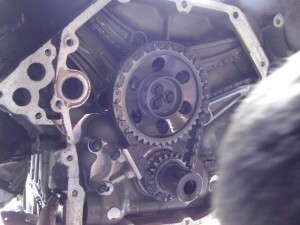 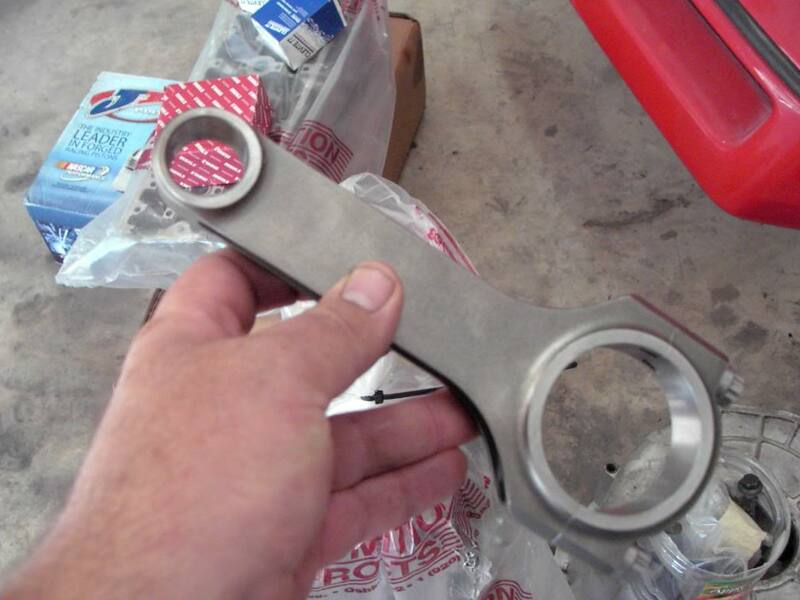 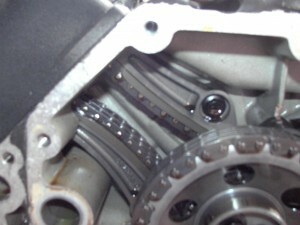 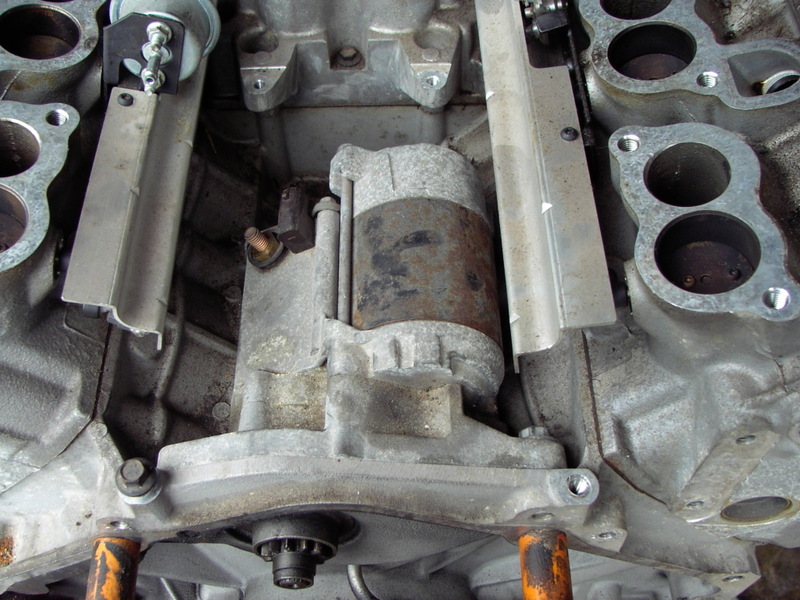 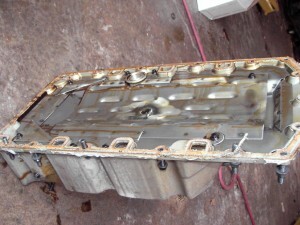 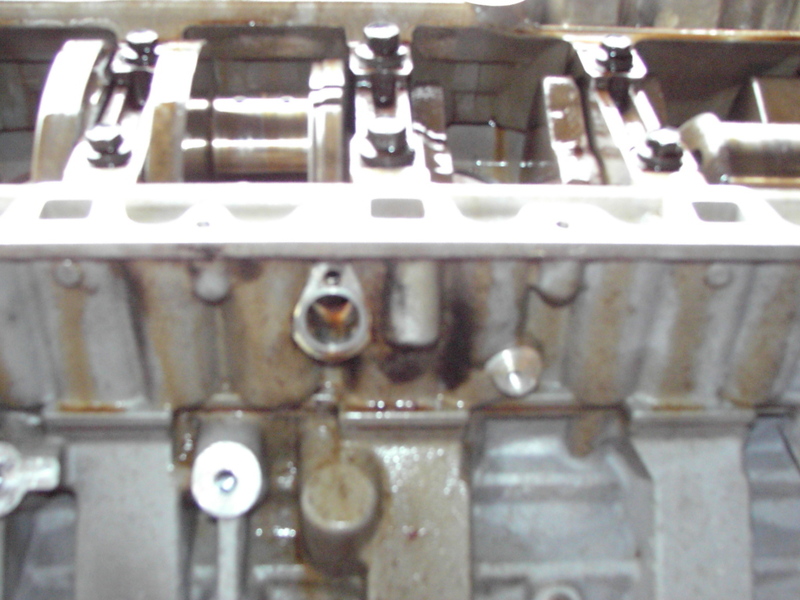 Oil pan has a built in windage tray……..
Oil pump pulls oil from the pan through this o-ringed port…. 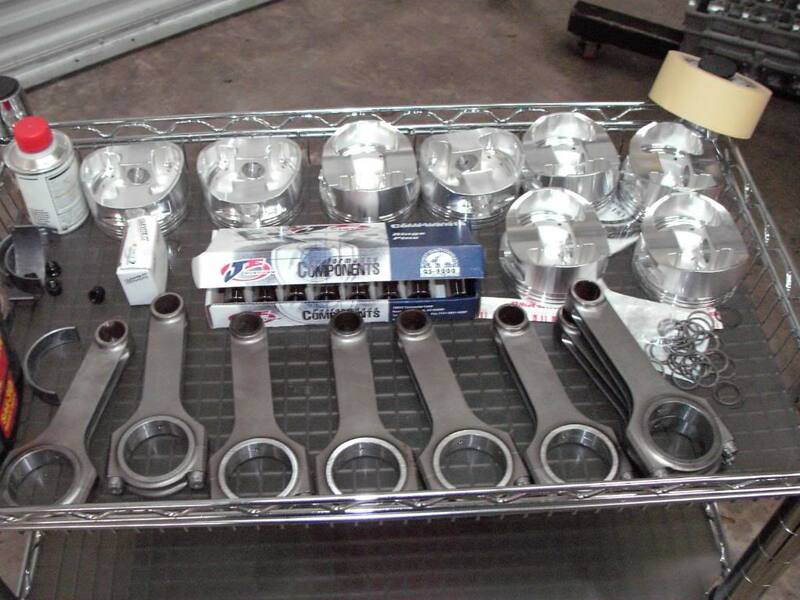 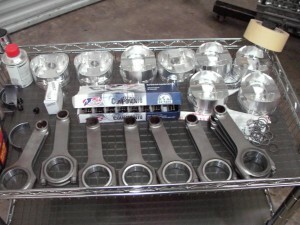 Mahle pistons and SPS rod bolts were used from the factory…. Here are some pictures of the very beginning of the port work of the heads….. 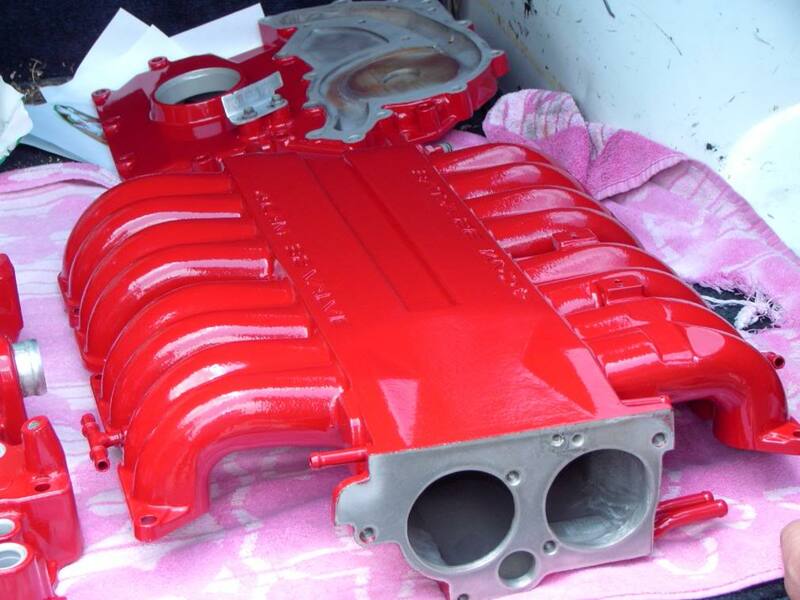 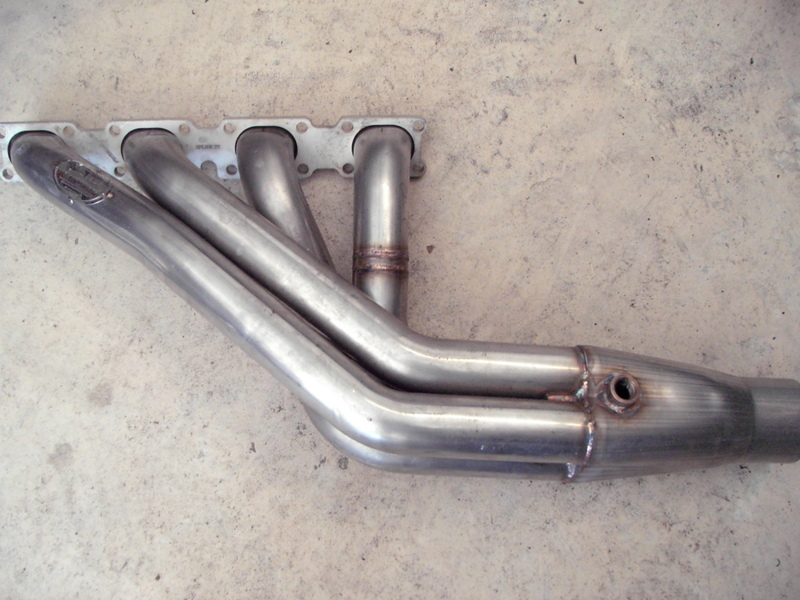 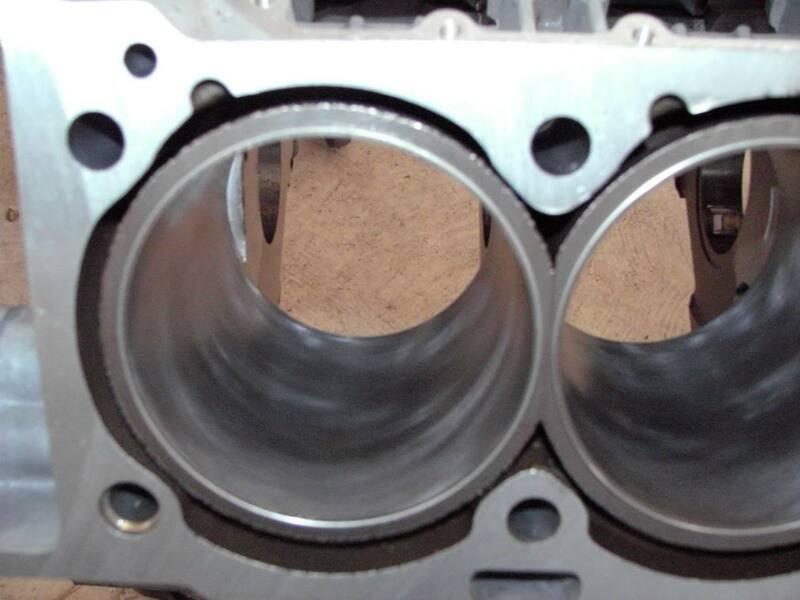 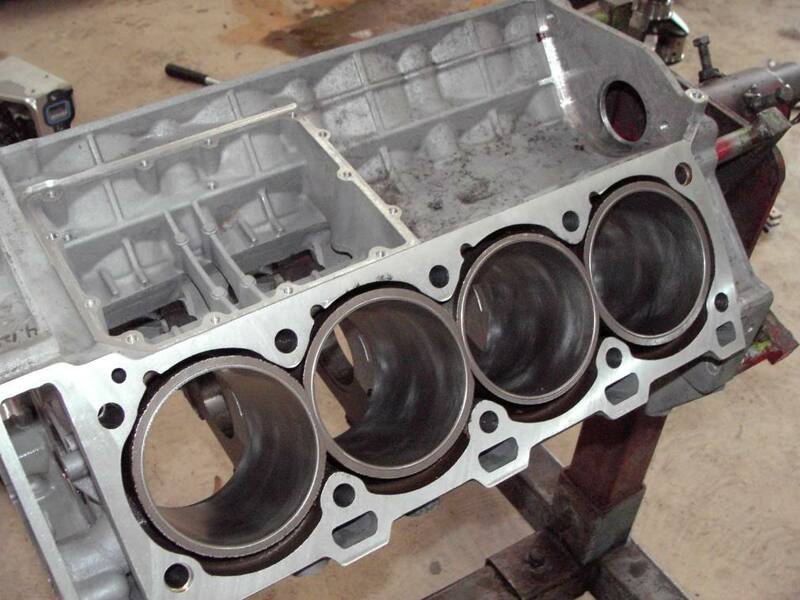 Here is a before shot of the head intake ports……. 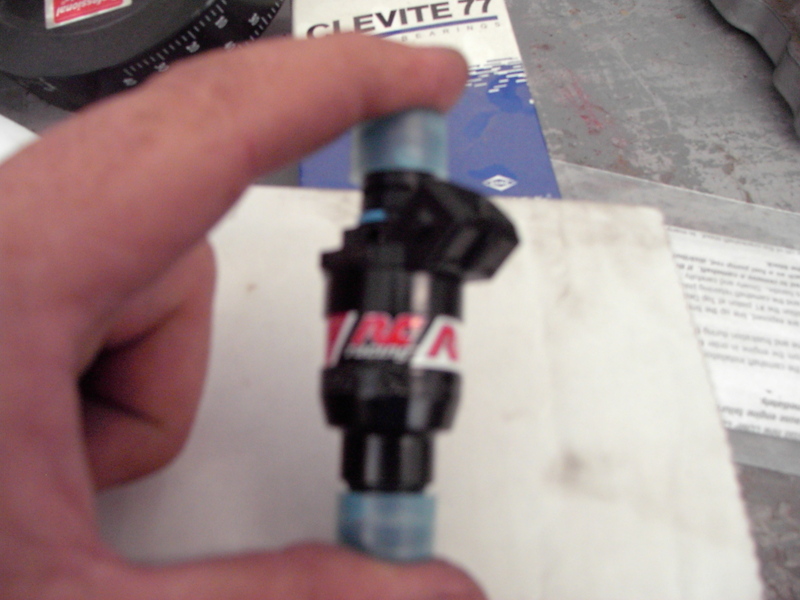 A shot of one of the RC Racing fuel injectors we will use…. 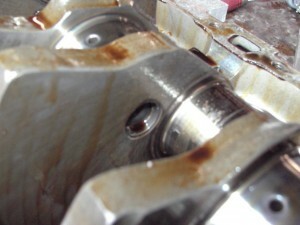 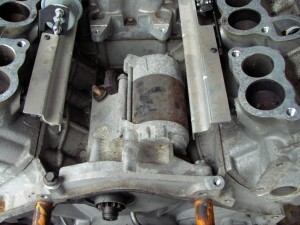 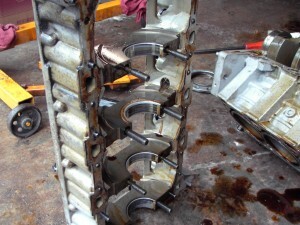 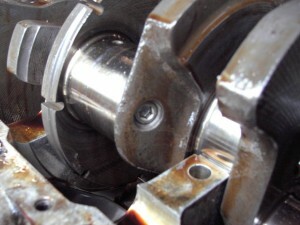 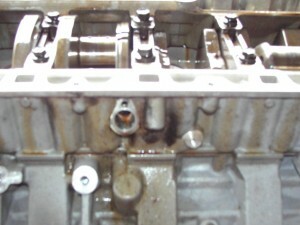 Close up of an injector housing. Pistons in and pan going on…. 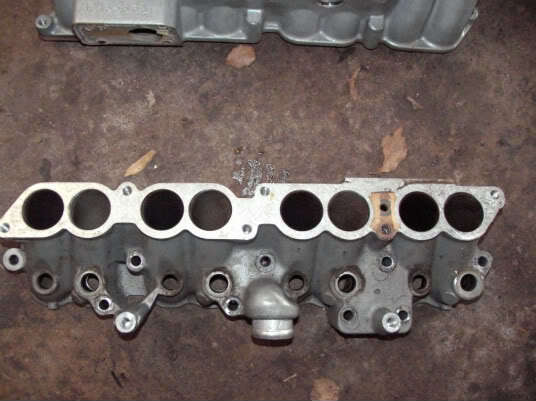 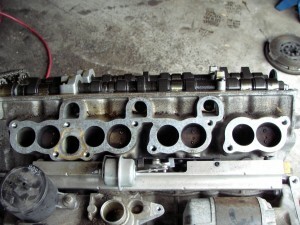 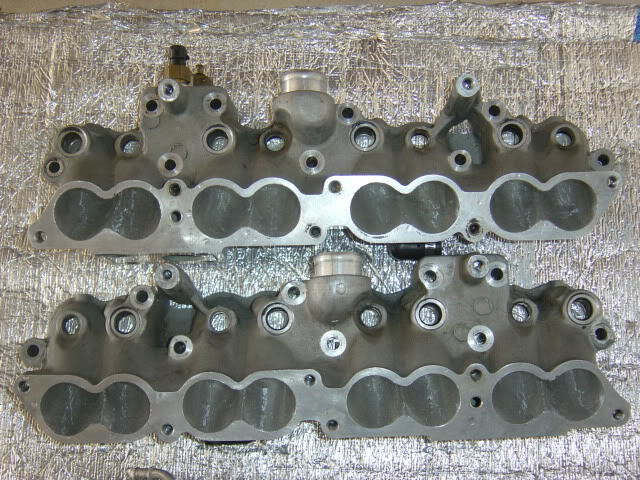 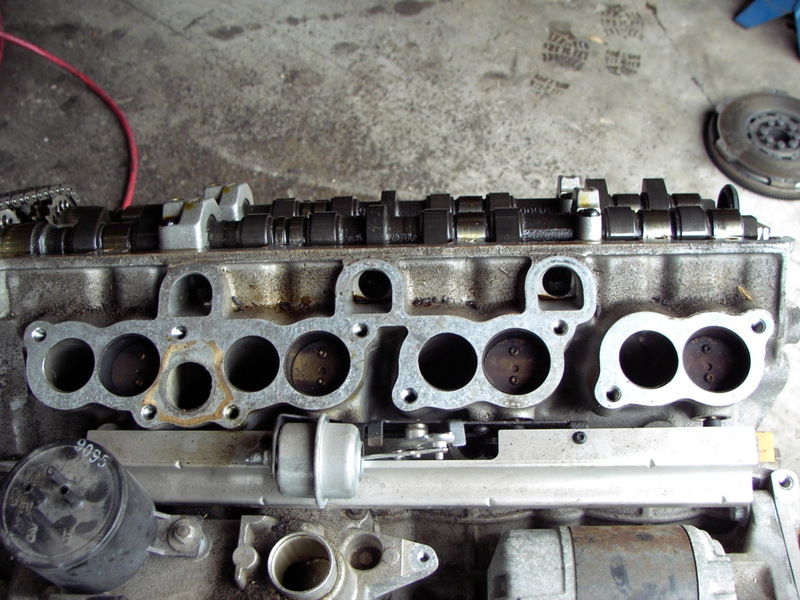 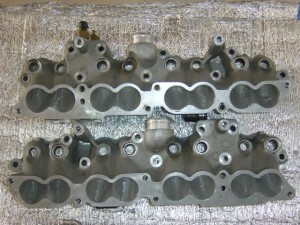 Cylinder heads on & torqued and injector housings laid on to check port alignment. 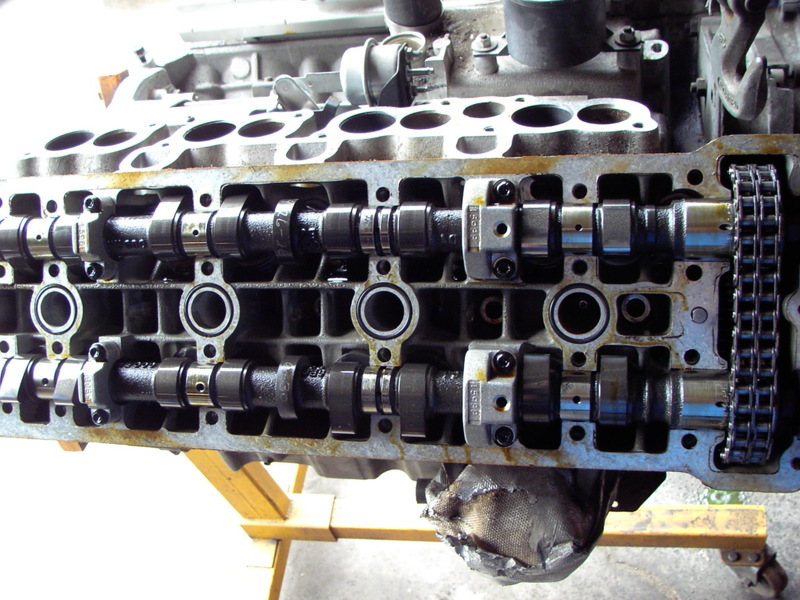 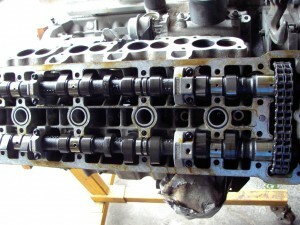 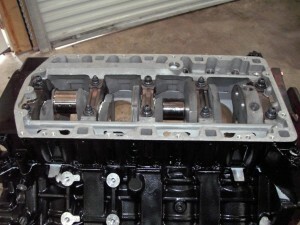 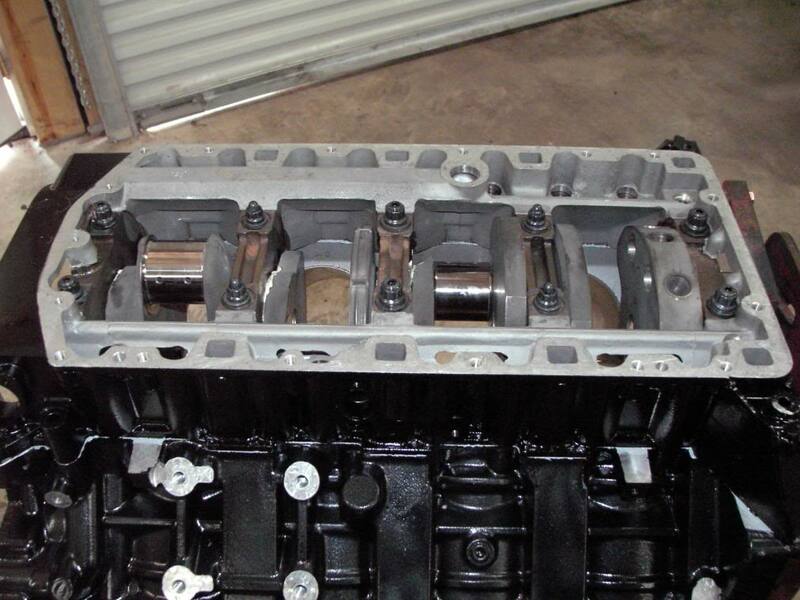 Next will be the time consuming procedure of degreeing the 4 camshafts.